Cherries are irresistible to me. I always eat too many then I complain because I feel bloated. I justify it by saying that they are purifying. A couple of years ago I found a small booklet covered in the same material that the traditional costumes of the women in Carinthia were made from. The book is called “Austrian Cuisine in 99 Recipes” by Helga Setz. This book contained many of the dishes I’ve eaten over the years on trips to Austria. This cherry pie is a classic of Austrian households. The cake is very caloric but delicious. 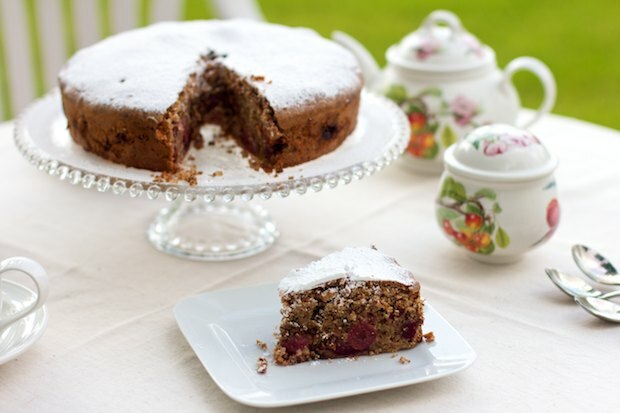 You should try this cake at least once during cherry season. Wash and dry the cherries, removing the pits and stem. Put them aside in a bowl. Soften the butter at room temperature. Work it into the cream with the egg yolks, ¾ cup the of sugar, vanilla, a pinch of salt, rum, and the milk. The mixture should be nice and swollen. Mix together the almonds with the flour and the grated chocolate. Whisk the egg whites adding the rest of sugar at the end. Mix the egg whites with the butter mixture, alternating spoonfuls of flour, almonds, and chocolate. Use a spatula and incorporate all movements from the bottom up to incorporate the eggwhites. Turn the oven to 350°F. Grease and flour a silocone cake mold. Place a small layer cake mixture (around the height of a finger), pour in the cherries with their juice, cover with remaining cake mixture, smoothing out the surface. Bake for about 1 hour. After 45 minutes insert a toothpick into the cake and if it comes out clean then the cake is ready, otherwise you can continue cooking for another 15 minutes. Remove from oven and let cool in the mold. When it is cool, place it on a plate and dust with powdered sugar.